In most ways, the business world is truly global in nearly every sense of the word. But not always. Take the U.S. Department of Justice's antitrust investigation into price fixing among automotive parts suppliers, a number of them in the rubber industry. 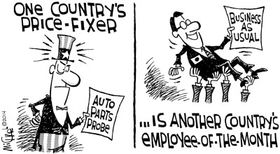 Since 2011, 31 parts suppliers—mostly from Japan—have pleaded guilty. Forty-six individuals, again almost exclusively Japanese, have been charged. And the DOJ has issued record fines totaling more than $2.4 billion. Europe, a sister publication of Rubber & Plastics News, got the inside story from a former expat who was one of those jailed in the probe. It is a compelling story, one that clearly defines the cultural differences between the two nations (read the story at www.rubbernews.com/pricefixing). “Mr. X,” as he is referred to in the story, was a middle manager, living in the Midwest when he was charged with price fixing. None of the 46 individuals has challenged the charges in court, with 26 agreeing to prison time and the others having yet to enter pleas or are ignoring the indictments. In some cases, the individuals continue to live in Japan and work for their companies. The case of Mr. X is not unusual, when viewed in Japanese terms. He said it was common practice for he and other Japanese sales managers in the U.S. to divvy up market share. It was the way business always was done, and it became more necessary as auto makers continued to push down parts costs. When he was charged, his company pressured him to plead guilty and, in turn, it would take care of his family while he was in jail and find a position for him after he was freed. That way, the company generally got less harsh penalties, and the details of its practices weren't revealed fully. While not illegal in the U.S. or Japan to keep an ex-convict employed, experts say that normally isn't the case in the U.S. The first instinct is to fire everybody. So while the Japanese have taken a firmer stance on price-fixing, the nation's last fine in this case was in March 2013, while the U.S. continues to seek indictments. And while the DOJ is starting to seek extradition in some cases, it's not likely the Japanese will rush forward to give up their own.